We are pleased to provide you with updated information about CLI and the CLI Power Coaches in the News. Betska K-Burr presents 'Coaching for Mind, Body, Spirit Mastery' at the CSTD National Conference in Toronto on Nov 19 2010. The CSTD Annual Conference brings together the largest group of training and development professionals in Canada. 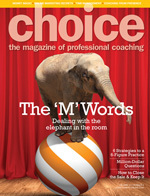 "Coaching today is taking a giant leap forward. Just like �talk therapy� is being replaced with more results oriented modalities, �talk coaching� is being superseded by scientifically engineered methodologies.